What makes America an ideal place for foreigners to travel to? If you were to break it down to its exact reasoning I believe it lies in the idea of what America represents. The land of the free means more than just social justice it also embraces the idea of free thinking and being open with yourself. It grants the opportunity of a life chosen instead of path already made. American teenagers tend to study abroad to get a taste of different cultures and expand their horizons. Chinese teenagers come to study in America to ease pressures placed on them by their own country. 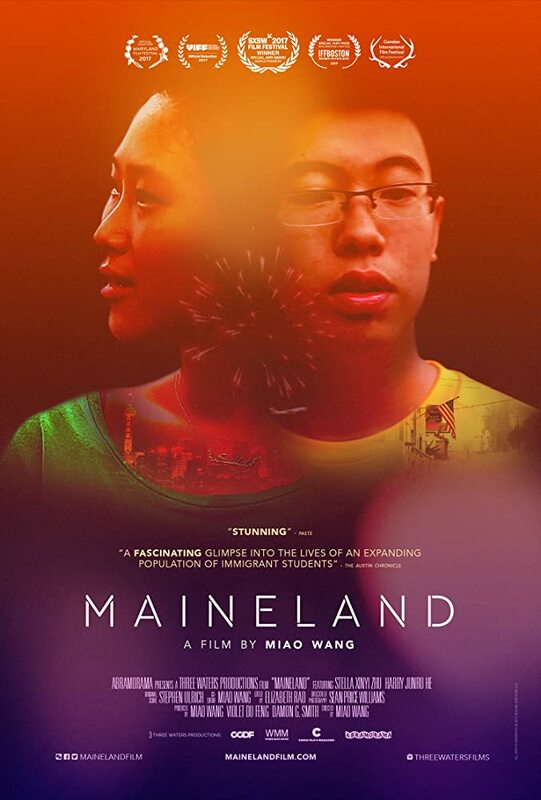 Miao Wang’s documentary Maineland depicts two Chinese teenagers over a three year period as they attend an American high school. Something I did not know was the extreme testing that occurs in China. Students are forced into these exams that pretty much are the blue print for their future. They start studying for a career path at an age when no one knows what they really want. These are pressures that are unwarranted and can deeply affect these young students. In part though this mentality is also based on the country’s culture. It is the resistance of going through this process that allow Stella and Harry to finish high school in America. The film follows both students as they make the big trip to America leaving their families behind for the first time. What I found comical about the students desire to come to America was that it was based on a “fantasy” America. Anything related to pop culture in music or television was more impactful than the education process. In the end though their “fantasy” America for now was in Fryeburg, Maine a town with a population of under four thousand. It was in the first part of the film we get an understanding of why the students wanted to come to America and what follows is their assimilation into American culture. It was not until the final thirty minutes of the film did I feel pulled back in. Once the students became adjusted to the school the film felt like a summer camp montage video. There were quick scenes of them talking to other students, engaging in activities but to me there was no substance to it other than “oh look their interacting with Americans”. What stayed with me were small moments such as Stella explaining to a guidance counselor that she wants to be a teacher but also be a business major; not because she wants to be both but because a business manager would pay better than a teacher which would allow her to take care of her parents. There is also a moment with Harry where he states he wants to apply to one particular college simply because they have a really good liberal studies program. It is their Chinese culture that is a part of them that affects their decision making. I would equate this experience to that of what the Amish call Rumspringa; when a young Amish teen leaves the community to experience what is outside their community then given a choice to either return or leave. Both Stella and Harry went to America to have that different experience and each grew in their own way. They each came out as different people when given the smallest bit of slack to figure out who they are as individuals. It is not about who is better: China or the USA, it is about being able to offer that opportunity to someone. They are each their own person to choose what they want in life and what they want to get from it and all that was attained just from visiting a small town in Maine.